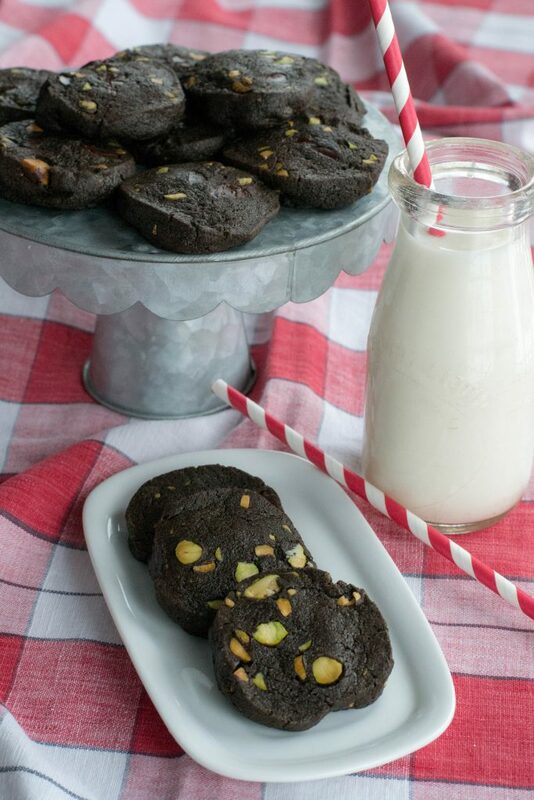 Dark Chocolate Pistachio Slice and Bake Cookies - What the Forks for Dinner? When making cookies for Christmas this year I wanted to make a chocolate cookie. It didn’t have to be a Christmas cookie per say, but just a nice chocolate cookie. In my early internet days I found Epicurious.com it was my cooking dream come true. Recipes galore at my finger tips. Spending hours on the site was not unusual. 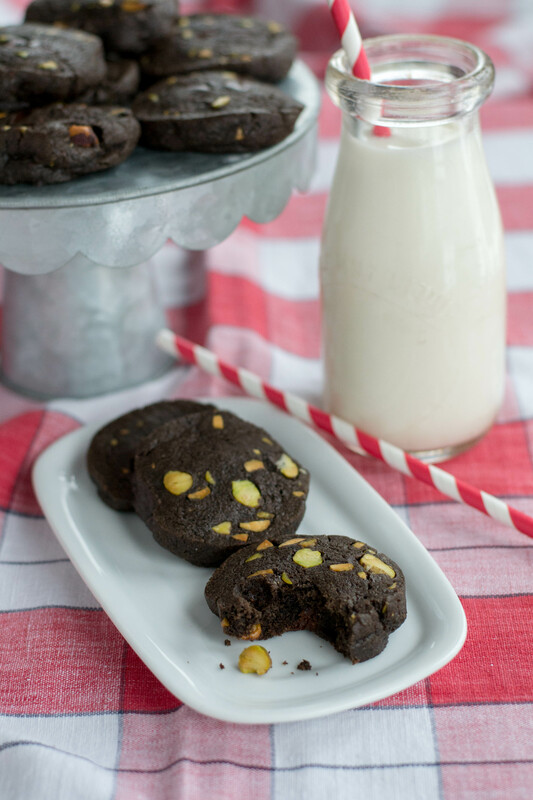 While in the site for inspiration….not for cookies, I saw a recipe for chocolate pistachio cookie. Sounded delicious. Delicious they were. A few tweeks and I had my chocolate cookie. Loving dark chocolate is an understatement for me. I can’t think of anything better. Hershey’s has a dark chocolate cocoa that will give that rich dark chocolate taste to any recipe that calls for cocoa. Over Christmas break from school, I reorganized my kitchen cupboards….much needed….and found a few ingredients I forgot I had. Some needed to be thrown directly into the trash, but the pistachios were A-ok and ready for these cookies. An odd bag of dark chocolate chips were just the right amount for this recipe and I was ready to bake! The thing I really like about these cookies is that you can make the whole batch, and bake them at your leisure. With a household of two, a whole recipe of cookies is just too much. If there are cookies I “will” eat them. Just one turns into four ….or five……yikes! 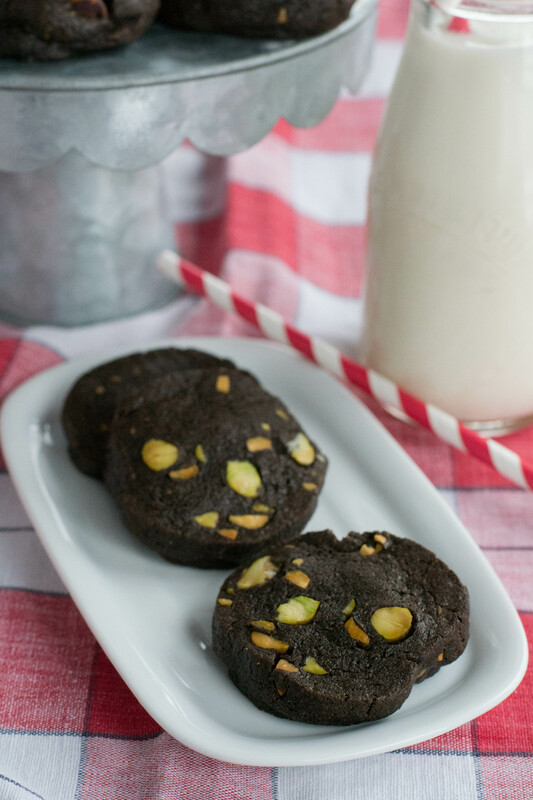 Dark Chocolate Pistachio Slice and Bake Cookies are divided into four logs. They need to be refrigerated, but can also be frozen for later use. I made these for one of my sweet treats for a card party. I used one log for the party…..not a ton of left over cookies…..and froze the rest. In the past few weeks when Tim and I had a chocolate sweet tooth, I pulled out one of the cookie dough logs, sliced, baked, and we had a dozen fresh delicious cookies. It works perfectly! 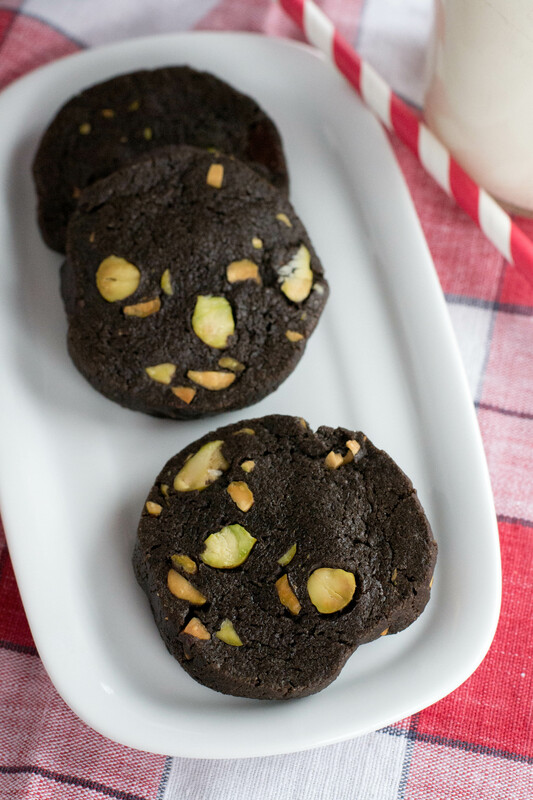 For a have on hand, ready in less than a half an hour, keep a batch of Dark Chocolate Pistachio Slice and Bake Cookies in your freezer! In a medium bowl whisk together flour, cocoa powder, kosher salt, and baking soda. In the bowl of your stand mixer on high speed, beat butter, brown sugar, and vanilla until light and fluffy, about 4 minutes. Reducing speed to low, gradually add dry ingredients mixing just to combine. Mix in egg white. Fold in chocolate chips and chopped pistachios. Divide dough into 4 pieces. Shape each piece into an log about 1 1/2″ in diameter. Wrap log tightly in parchment paper and chill until firm, at least 4 hours. Cut logs into 1/4″–thick rounds and transfer to parchment-lined baking sheets, spacing 1/2″ apart. Bake cookie in preheated oven 10–12 minutes or until set around edges and centers look dry. Transfer to wire racks and let cool. MAKE AHEAD: Cookie dough can be made 1 month ahead; freeze instead of chilling. Slice frozen logs into rounds just before baking.